Political Studies examines the use and abuse of power in societal struggles for justice, equality, freedom, and the common good. It deals with issues, at the local, national and international levels, relating to government and governance, authority and legitimacy, equity and resource distribution, rights and responsibilities, and peace and conflict. You will learn about the forces and factors that influence the process of political decision-making, including ideologies, political parties, political leadership, civil society, elections, and the media. You will also gain an understanding about threats to global stability including poverty, environmental degradation, human rights violations, and migration and refugees, amongst other topics of contemporary national and international significance. Examines the goals, strategies and actions of international terrorist groups, the efforts of governments to combat terrorism, and the effect of international terrorism on contemporary international relations. Special attention is given to philosophies of violence and to ethical issues surrounding terrorist and counter-terrorist actions. An examination of the ideas and debates that inform international ethical thought, including Realism, Marxism, Feminism and Liberalism, among others, followed by consideration of contemporary international politics about which difficult ethical choices have been made or about which there is ethical controversy, including international intervention, threatened use of weapons of mass destruction, sanctions, promotion of international human rights, human trafficking, and child labour, amongst others. 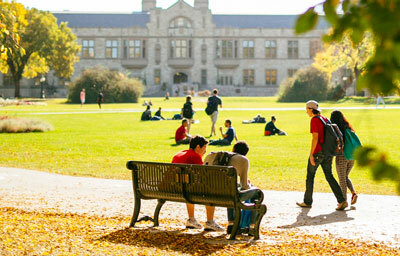 The Political Studies program has a reputation of being among the best medium-size programs in Canada in its field. Because the department is smaller in comparison to other political science departments in Canada, there is closer contact between students and faculty in course and thesis work. Faculty in the Department are well-known to the local, provincial and national media as experts in their fields, providing analysis on national and international issues of various kinds on a regular basis. They have also distinguished themselves as leaders and members of Royal Commissions, task forces and other public bodies, and as expert witnesses providing testimony to committees of the House of Commons and Senate and of the Saskatchewan Legislative Assembly. The Department of Political Studies has exchange programs with both foreign and Canadian universities. Presently, programs exist with Chernivtsi State University in Ukraine and with the Universities of Marburg, Oldenburg, Greifswald and Rostock in Germany. You also have the opportunity, by registering for POLS 398, to study the politics of the European Union in Brussels, Belgium for two weeks with a University of Saskatchewan professor and other students. Opportunities also exist with the Washington Center for Internships and Academic Seminars which is headquartered in Washington, D.C., and which provides students and professionals with placement options mainly in Washington, D.C. and in selected cities abroad.